Excellent creatine stack for use after the training, which was developed specifically for the fighters! Excellent composition takes into account the complex demands of athletes. Highest quality and efficiency! IHS Crea Fight is the most perfect stack creatine for fighters (and not only) for use after a demanding workout. Maximizing the results achieved is a priority. Advanced composition includes not only the great chemical forms of creatine as well as plant extracts, the addition of vitamins and minerals to ensure the best conditions for the development of the organism. 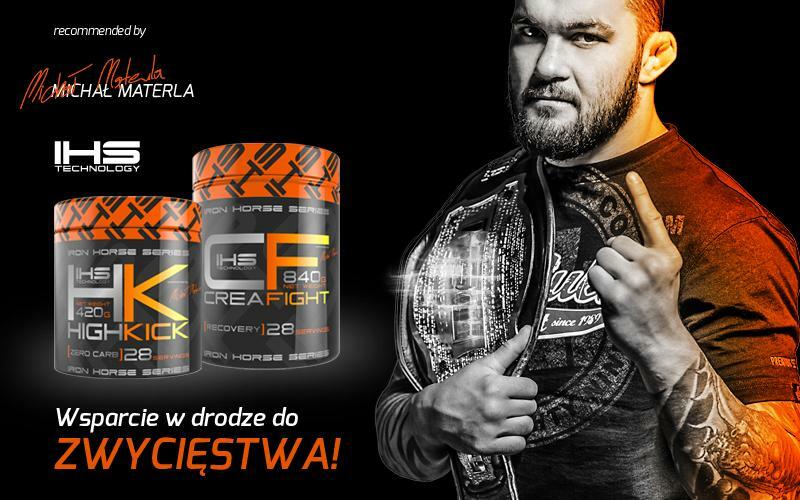 IHS Crea Fight has the highest quality of applied substances: hydrolyzate whey protein isolate, the highest quality carbohydrates, the best and strongest creatine, branched chain amino acids BCAA enriched with L-glutamine + extracts of Rhodiola rosea and magnolia Chinese, that is, all the essentials for recovery time. This has a significant impact on the speed of the results achieved or to improve the overall efficiency of motor body (depending on the plan and for training purposes). Regular use of IHS Crea Fight after training provides an efficient regeneration of the muscular and nervous system. This is ideal for endurance athletes looking for an uncompromising solution post-workout. The content of protein hydrolyzate provides off essential amino acids that affect the correct muscle regeneration. Carbohydrates provide the necessary energy while, you even strenuous exercise is not dropped from the forces. Advanced mix, which includes: creatine monohydrate, creatine malate Tri-Creatine and Glutamine forming part of IHS Crea Fight strengthen and improve the performance of your muscular system and significantly accelerate the regeneration of the exhausted muscles. Contents massive doses of vitamins and extracts of Rhodiola rosea and magnolia Chinese ensures rapid regeneration of the overloaded nervous system. The ideal solution for those who are neither in training nor outside of them do not go to any compromises. IHS CREA FIGHT - REVOLUTION WITHIN supplements! Dissolve 2 servings (2 scoops of the product) in 400ml of water, eat right after a workout. 1 serving (1 scoop of the product) dissolved in 200ml water and consume on an empty stomach. Ingredients: maldodekstryny niskocukrzone, whey protein hydrolyzate, creatine monohydrate, creatine malate tri creatine, L Tyrosine, L-glutamine, Schizandra chinensis (fruit extract), Rhodiola (extract), lactoferrin, citrate, magnesium oxide, calcium salt of ortofoforowego , l-ascorbic acid, nicotinic acid amide, acetate, DL-alpha-tocopherol, D-calcium pantothenate, zinc oxide, ferrous fumarate, pyridoxine hydrochloride, riboflavin, beta-carotene, thiamin mononitrate, copper sulfate, manganese sulfate, retinyl acetate, folic acid potassium iodide, D-biotin, phylloquinone, chromium chloride, sodium selenate, sodium molybdate, cholecalciferol, cyanocobalamin, sweeteners (saccharin sodium, sikraloza), fruit flavor, color: yellow orange, anti-caking agent silicon dioxide, orange flavor to taste orange, pineapple aroma for the pineapple flavor, lemon aroma for the lemon flavor, color: żółcieńpomarańćzowa for orange flavor; choline yellow for lemon flavor and pineapple. konkretny sztos , trenuję sporty walki , jestem na etapie początkowy, dużo mi pomaga ten suplement siła na plus i atp mięśni wzmocnione ,ananas pycha !